The Trial Chamber in the case of Ratko Mladić granted today the Prosecution’s motion to reopen its case to present recently discovered evidence regarding the Tomašica mass grave in the Prijedor municipality, Bosnia and Herzegovina (BiH). Following this decision, the Prosecution will now be able to tender the evidence of six expert and seven fact witnesses, as well as additional documentary evidence. The time of re-opening will be determined by the Trial Chamber in due course. The Chamber ruled that the Prosecution was unable to present the Tomašica evidence earlier, taking into account that the grave was discovered in September 2013, at a time when the OTP case-in-chief was ongoing, and also considering the time needed to analyse the grave and compile witness statements and expert reports. The Judges also found that the fresh evidence was relevant to the case, and had probative value, noting especially the Prosecution submission “that the Material clarifies the organised and large-scale nature of killings in Prijedor, and the VRS’s [Army of Republika Srpska] role therein”. The Chamber conceded that the re-opening will prolong the trial, but that the delay will not be undue. The Judges considered that the OTP’s motion was filed early in the Defence case, and the Defence will “have ample opportunity to present any evidence in response to the Material as part of its case”. The Prosecution submitted a motion to the Trial Chamber requesting to reopen its case-in-chief on 26 August 2014. OTP asked to present previously unavailable evidence in relation to a recently discovered mass grave in Tomašica. 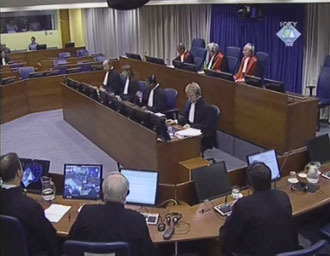 The Defence filed its response to the Prosecution’s motion on 9 September 2014. The Defence argued that reopening the case at this stage would prejudice the defence case and that an adjournment would be unavoidable while the defence is in the middle of presenting its case, among other reasons. Ratko Mladić, former Commander of the Bosnian Serb Army (VRS) Main Staff, stands accused of genocide and a multitude of other crimes committed against Bosnian Muslim, Bosnian Croat and other non-Serb civilians in BiH from May 1992 to late 1995. Mladić was initially indicted on 25 July 1995. After having been at large for almost sixteen years, he was arrested on 26 May 2011 and transferred to the Tribunal on 31 May 2011. His trial commenced on 16 May 2012. Since its establishment, the Tribunal has indicted 161 persons for serious violations of international humanitarian law committed on the territory of the former Yugoslavia between 1991 and 2001. Proceedings against 141 have now been concluded.